Manufacturer of a wide range of products which include first aid box and suggestion box. It is a matter of great pleasure for “Raja Interiors” to convey that since last twenty years we have been in the process of offering best quality products to our valued customers and their level of satisfaction has played vital role in transforming “Raja Interiors” into leading manufacturer and supplier of “Alluminium ladders and Garment Hangers” and many other utility products. “First-Aid Box” which is extremely useful in case of medical emergency as it contains basic dressing materials, ointment etc. Box also contains detachable key-holder for keeping the keys which are frequently used and also provides enough completely visible space for writing emergency contact numbers according to requirement and as such we have tried our best to tailor this product to cope with the unforeseen emergencies in triangular way. 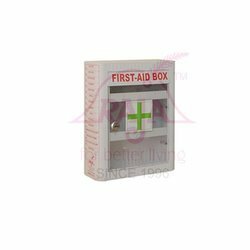 Multi-use First-Aid Box is made out of 100% long lasting ABS plastic having graceful look and available in attractive colours and we also provide facility to have logo of the company on front part of the box and most importantly cost of the product is only Rupees 500/- inclusive of all taxes and delivery charges. Further, product is so designed that it could be utilized for the office as well as for the personal residential use. Owing to our proficiency in this domain, we are betrothed in offering an extensive range of Suggestion Box. The offered suggestion box is made with best quality of material that is highly durable. Our suggestion box is widely admired & has extensive usage in offices, societies & other related areas. Apart from this, our clientele can take this suggestion box from us in different sizes.